Earlier this month, cereal giant General Mills announced the first finger food of American babies, the company’s original Cheerios, would be GMO-free. The announcement was received with resounding applause from food activists and moms alike. But unfortunately this wasn’t a case of a food-maker bending under the pressure of GMO activism, merely a smart marketing move. To make the original Cheerios GMO-free, all General Mills had to do was change two relatively small ingredients—corn starch and sugar beets—both of which were used in small amounts in the formula to begin with. You see, Cheerios are mostly oats and oats are not genetically modified. General Mills simply moved to non-GMO corn starch and cane sugar. It was a small change and a cheap change, but the company will be reaping rewards all the way to the bank. A growing number of Americans don’t want genetically-modified foods. In fact, 90% of Americans say GMOs are unsafe, while 93% favor GMO labeling laws. Individuals are recognizing the questionable safety of these frankenfoods in light of several studies linking them to ill health and even cancerous tumors. At the very least, we would like to see GMO foods labeled as such (even though labeling will never stop GMO crop contamination). So, when consumers see a product with a “GMO-free” label, they are more likely to pick it up than a non-labeled competitor. General Mills has admitted it would be far too expensive and unrealistic for them to consider changing their other Cheerios varieties to non-GMO. They say on the Cheerios official website that it would not only be difficult, but likely “impossible”. In other words, they have no intention of doing it. It wouldn’t be a smart business move to even attempt it as the costs would outweigh the potential benefits. 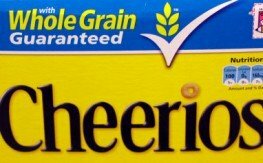 Instead, the cheap decision to eliminate genetically modified ingredients from original Cheerios will likely result in a windfall as consumers will be more likely to reach for the yellow box now that it can carry a “non-GMO” label. To be certain your cereal didn’t contain genetically-modified ingredients before, you would have to look for the USDA organics label or to be even more assured, the “Non-GMO Project Verified” seal. Now, however, that tried-and-true classic, the one you likely ate in your high chair, it’s free of GMOs too. There’s a good chance we will see more food makers offering small sacrifices like General Mills did with Cheerios, but these sacrifices are going to be well-calculated and small indeed. These corporations are interested in their bottom-line and the move to take genetically-modified foods out of Cheerios was nothing more than smart marketing. Don’t ever eat any of these fake breakfasts. There is usually too much sugar in them anyway. Good old fashion organic oatmeal- can’t beat it. Still boycotting all of their products INCLUDING Cheerios. sacrifice? You have got to be kidding me! When is this big event going to take place? I am glad for whatever reason if they do the right thing. If they make money, good, maybe more will do the same. As long as its real, I dont care if they do the right thing for the wrong reasons.